The 55 mph zone on the major interstate highways I-87 and I-90. People call our offices from as far away as the northernmost provinces of Canada, Florida, and California asking us questions about how the 65mph speed limit "disappears" when entering the Capital District from the north, south, east, or west and magically becomes 55 mph with little warning. 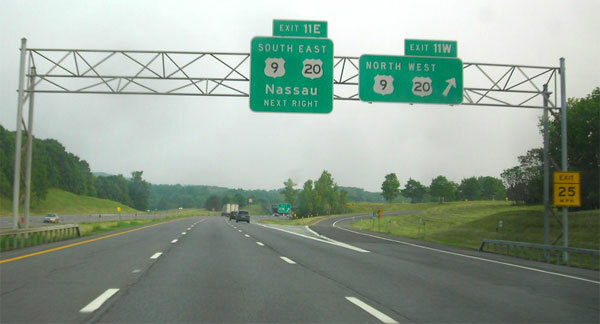 The crossroads of these interstates of the New York State Thruway and the Adirondack Northway are in the town of Colonie, which I understand generates the 4th largest revenue in the state for traffic tickets. The highways are patrolled heavily by the New York State Police and, occasionally, Colonie Town Police and Albany County Sheriff's Department. Because of the State University of New York, an occasional University police officer will be writing tickets. The speeds are reduced by 10 mph as far out as Clifton Park on the north at or about exit 8, and east at or about Nassau on I-90, Rotterdam heading east on the Thruway and other locations. Watch out for the change in speed limit while driving around the Capital. If you do get stuck with a ticket and need a traffic lawyer, please call or fill out our form here on the right.